I’ve said it before and I’ll say it again. 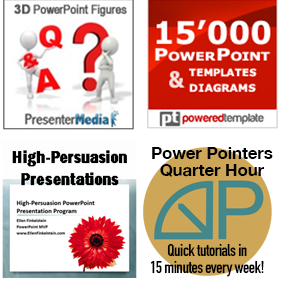 Your PowerPoint file is not your presentation; what you say before an audience is your presentation. Therefore, before or after you create your slides, you still need to write your presentation. If you create your slides first and then your presentation, expect that you’ll find that the logic of your content will lead you to change (and improve) the organization of your slides. So sit down and write out what you’re going to say. It doesn’t have to be word for word, but definitely idea for idea. You can do this in your word processor, but you can get extra value out of it (or save some steps) by typing in the Notes pane of each slide. Print out the notes pages. Choose File > Print and choose Notes Pages from the Print What drop-down list. You’ll get one sheet per slide with a picture of the slide and all your text. Use the notes pagesfor practicing out loud. Practice speaking out your presentation and using the slides at the same time. After you’ve rehearsed and you think you’re up to speed, to best hear how you sound, use PowerPoint’s narration feature to record yourself giving your presentation as you go through the slides. I explain the process briefly in my tip, “Rehearsing with narration.” Then sit back, put your feet up, and play the PowerPoint presentation with your narration. You’re sure to find something to improve. Use the printed notes pages for your notes when you present. Finally, you can use Notes Pages as handouts. Cliff Atkinson suggests this technique in his book, Beyond Bullet Points. Why? Because then your audience gets to read what you said (which is your presentation), not just your slides. Presenters often e-mail the PowerPoint file to people who missed the presentation, but the slides tell only a very small percentage of the story and can therefore be misleading. Using notes pages in this way gives you a process that takes you from initial conception through rehearsal,delivery, and handouts.